Teaching Social Media as a tool is imperative in todays day and age. Facebook, Twitter, Instagram and Youtube are all applications that many of our students frequent everyday. We also hear horrible stories of mistakes teens and adults have made that they can't take back on social media. A snap of a picture that is sent via text could be detrimental. Saying something inappropriate on Twitter or Facebook can put you in a lot of hot water or worse....jail. This is why I teach social media norms and etiquette in my classroom. Do kids make mistakes? Of course! I encourage mistakes, because we learn from them. I want my students to make those mistakes while they are in my class. 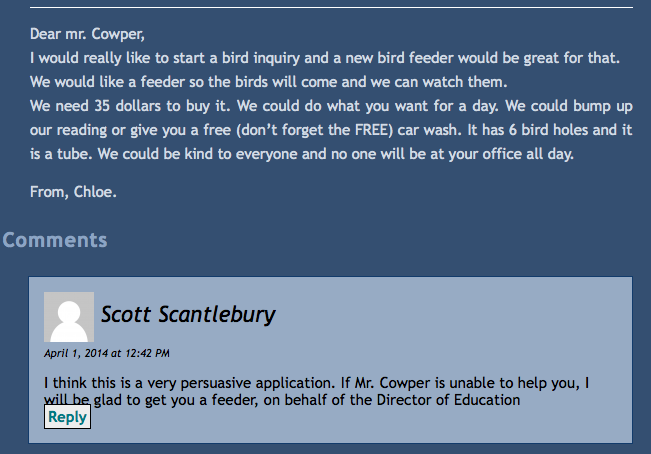 An inappropriate comment on someone's blog is a lesson learned in my class and hopefully not repeated. The mistakes that are made in grade 2 are a lot less harmful than when that student is in high school. My students see Social Media as a teaching tool. Twitter is embedded into the daily instruction in my classroom. As well as posting their learning on their personal blogs or uploading their work to our Youtube Channel. Our classroom Twitter norms were created with my students to ensure ownership of our norms. A few weeks ago we were working on writing a persuasive letter. I wanted to make this an authentic task so as a class, we brainstormed a list of things that we could persuade our principal to buy or let us do. My students agreed that they wanted to persuade our principal into buying us a bird feeder to put outside our observation window. 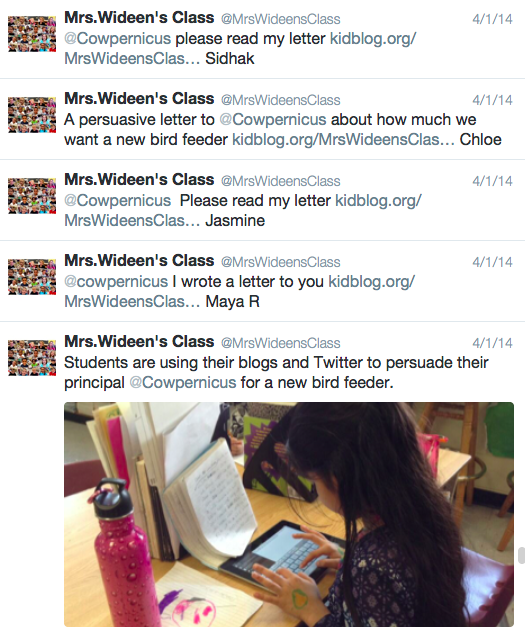 My students came up with the idea to post the letters on their blogs and then tweet them directly to our principal on Twitter. Students tweeted their letters and got responses from not only the principal. 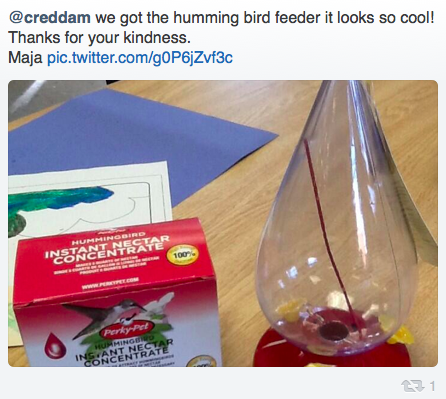 We received a bird feeder and birdseed on behalf of our Director of Education, a bird house that one of our students made and a humming bird feeder from my mom. One of my student's letters on their blog. (Check out the response). I think the above tweet says it all. The connections being made in my classroom that day was amazing. Students were discussing how powerful social media can be. They spoke about how quickly the message got around and how if they would have delivered the letter to the principal's office we would have not received all of this support from other people. This also sparked a conversation about if you were to post something that was harmful or inappropriate on Twitter, how many people could potentially see it very quickly and how you can't take something back even if you delete the tweet after it has been tweeted. These conversations help mold my students opinions and work ethic around social media. I was so excited to get a tweet on the weekend from a student that on their own, researched about our current inquiry and tweeted it to me! (Remember, he is in grade 3). This student isn't using social media to see what Justin Bieber is up to or to ramble on about his weekend. He is using it in a purposeful way to show his learning. 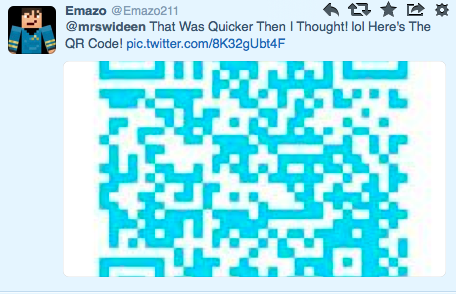 After the weekend, my student was all set with two QR codes printed out to share with the class. Amazing! Remember mistakes are welcomed in our classrooms and when children make mistakes it creates new learning. Don't be quick to "shut it down" when a mistake is made on social media. Be thankful it was made in a controlled environment where students can learn from their mistakes without it being detrimental down the road.